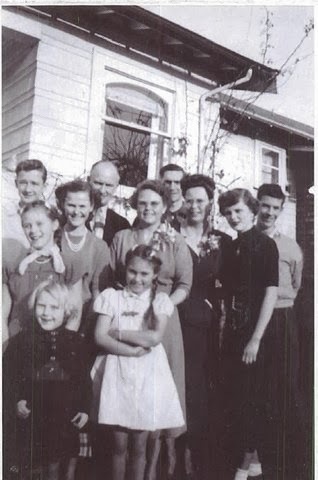 I can't remember the occasion on which this picture was taken, but we are posing in the back yard of our house on Kitchener Street and the whole family is there, including our foster brother and sister and her brother who was visiting. In the front row from the left, I see the youngest cousin, Lynette Humphreys and next to her with the braids is her sister Merilyn. In the second row, from the left is cousin Adele, my sister Jean, my Mom Winnie Filer, my Auntie Grace Humphreys and me. Right behind me on the right is our foster brother Jimmy Dobie. And in the very back, between Mom and Auntie is Uncle Rev. Frank Humphreys, my dad Rev. Fred Filer and on the back left, my foster sister Louella' brother whose name I have forgotten. Luella, age 14, was the photographer. By looking at us you would never guess that in a few short years there would tragedy. It began with Louella. She was 12 years old when she met my parents at the Keats Island Baptist Camp where Dad was pastor and camp director and Mom was the camp nurse. She had been sent to camp by the Social Services. Every year they sent children who lived in their children's home to the camp. In those days they didn't have so many group homes or foster care and kids from disadvantaged and messed up families were taken into care and placed in this home (somewhere around Marine Drive I think) that was like an orphanage. Luella's father was an alcoholic and her mother had left the kids, as far as I know. Both Luella and her mother were in the Home until my parents met Luella at camp and decided to bring her to our home to live. Her brother, I think, was eventually in foster care too. Luella was a difficult girl but my parents did all they could for her and she was treated the same as my sister and I. She had only been at our house for about two years when she requested that the Children's Aid take her back. She found my parents too strict and didn't like to obey all the house rules, attend church and behave in an appropriate way. She might have even been stealing money out of the jar where mom kept coins for small purchases at the grocery store. It was with great regret that my parents let her return to the Home. And it was even with more regret when later they learned she had run away from there and was pregnant. Nobody knows what happened to her child but it's assumed it was taken away for adoption. Not long after that Luella ended up in the Girls Home (prison for young offenders) on Cassiar St. When she got out of the Young Offenders prison she went into the care of the Salvation Army. One day my mom got a phone call from them to say where Luella was. She went out and bought some roses and was headed to the Salvation Army home to visit but by the time she got there, Luella was gone. And soon after, she was incarcerated in Oakalla Women's Prison. She was 17 years old and a drug addict. A friend of mine worked at Oakalla as a matron. She was there the day the tragedy happened. Luella was found dead in her cell.They claimed that she died of a brain tumour, but my friend speculated it was likely a drug overdose because at that time heroin was readily available to inmates. I went to Luella' funeral at the funeral home on Powell St. by Gore Ave. The casket was open. They had dressed her in an older woman's blue dress. She didn't look like the innocent kid who used to live with us. She looked like a worn out old lady. That vision of her has never left my mind. Not to many years after this photo was taken, my foster brother Jimmy, who had also met my parents at the Keats Island camp when he was 12 yrs old, found his birth mother and her new husband. Jimmy had cerebral palsy and was living in the Children's Aid Home when my parents first met him. My parents invited him to come home for the weekend and he misunderstood and thought they meant 'forever'. They didn't have the heart to send him back. He was the most delightful boy, charming in every way and loved by everyone he met. Mom took him to speech therapy and he tried his best to be like other kids. He was determined some day to drive a car. I'll never forget the day dad enrolled him in Templeton School and Jimmy came home crying. They had put him in the 'special' class with children who were below average and low achievers. He was mortified. It also upset him in later years when people thought he was 'drunk' because of the way he stumbled when he walked. Dad had the school put him in a regular class and he did his best to keep up though it was hard for him to write with a pen. (Nowadays they have computers for kids with disabilities). He managed to get get through junior high and then he got a job as a janitor for Fleck Brothers. When he found his birth mother, she was living on a shrimp boat over in Deep Cove with the man she had married. Jimmy was invited to visit them. He was delighted about going, but unfortunately while there he fell on the ladder leading down into the hold and injured his ribs. It wasn't long after, when the ribs failed to mend, that the doctors discovered that Jimmy had cancer. And it was terminal. When he died, my parents got messages from all over the neighbourhood from people whose lives Jimmy had touched. Just watching him bravely struggle down the street day after day was an inspiration to everyone. And his bright spirit, beaming smile and good nature endeared him to everyone. We buried Jimmy's ashes under a tree at the Campfire Rock on Keats Island because that's where he had met my parents. When he died he left a sum of money which my parents used to purchase the cottage we used to have on Keats. And at the camp there was a camp cabin named for him with his picture on the wall. Of the people in the picture, only my sister and my cousins and I remain. Everyone else is gone now. First Uncle Frank who died far too young after a gall-bladder operation; then my dear Mom who passed away at age 53 from cancer; My Auntie Grace, mom's younger sister, who was my favorite and a most inspiring woman; and then my dear dad who lived to be 90. Yes, every picture has a story, and this one had some sad parts to it. But it's nice to look at it and remember, and think about how happy we all were that moment the photo was taken. Post note: When I wrote my play "The Street: A Modern Day Tragedy", set in Strathcona and based on true events, I based the character of "Sally" on my foster sister Luella. And the play is dedicated to Luella and my former boyfriend Jimmy Bain, who inspired the story. The play was produced successful by Theatre in the Raw and ran for 3 weeks at the Web Cafe on West Hastings St.